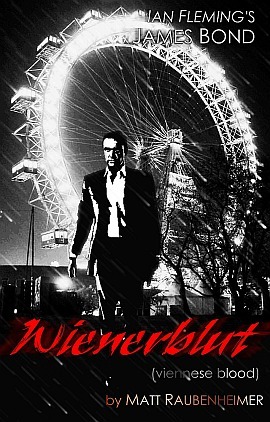 While James Bond relaxes in a very rainy Vienna after a succesful assignment a bizarre set of circumstances are busy unfolding and Bond’s leave is about to get as unpleasant as the weather. One of Bond’s best friends who also happens to be the head of Station V in Vienna goes missing and Bond decides to take the law into his own hands in order to get his friend back. Bond must face up to the consequences of his own cold-blooded actions in an incident which could bring an end to his career as a double-oh. These words could not be more true for Ian Fleming’s Master Spy, James Bond in ‘Wienerblut’ by Matt Raubenheimer. Also included is the short story, ‘A Chance To Die’, in which Bond finds himself inches from death in Paris! December 30, 2013 in Fan Fiction, Literary 007.